London's famous Kingsmill's building was acquired by Fanshawe College in November 2014. This is what Kingsmill's looks like in May 2016. I applaud the expansion of Fanshawe College into downtown London, since I work for a Dundas Street business that's likely to benefit from the increased number of students. And as a Wellington Street resident I'm in favour of a living, breathing city core. This article gives a good overview of the building project so far and includes an illustration of the finished structure, due to open in September 2018. Notice the setback of the new tower, probably meant to preserve the integrity of the original building by separating old from new. In the article, Shawn Harrington, Fanshawe College's senior manager of campus planning and capital development, is quoted as saying, "The challenge was the high cost of renovating existing buildings, many of which are in the designated Downtown Heritage Conservation District ... The city and the college reached an agreement where the city would provide a grant to the college to offset the high cost of renovating these properties downtown" (italics mine). And Branka Gazibara of Diamond Schmitt Architects says, "The downtown London precinct is designated to preserve historic buildings, so this project respects that and will retain the street character fronting the busy Dundas Street and Carling Street sides." I'm not disparaging Mr. Harrington or Ms. Gazibara, who l'm sure perform their jobs competently and enthusiastically, but this project is not a renovation, nor does it preserve a historic building. This, except for one limestone wall, is a demolition. The article also states that bricks from the red brick portion of the Dundas Street facade have been catalogued for "reinstalation" at a later date. That portion will be reconstructed to look "similar" to the original facade. Counterfeit heritage. I understand the interior of the department store had to be gutted, because the original building had wood floors and joists that wouldn't support the predicted new loads. The narrow structural bays are also not suitable for a modern college facility. The demands of modern occupancy are definitely among the challenges of adaptive reuse. Makes me wonder whether a conversion to offices or apartments wouldn't have made more sense that a college facility. I've ranted about facadism here but I can't resist doing it again. When the facade of a building is preserved with a new building behind it, it's considered a compromise between property redevelopment and preservation. It's a middle ground between preservation and demolition. And it's happening in nearly every city around the world. The result, however, is an historical fragment, a sham, a folly. What will future generations think of this compromise? Not everything needs to be saved. It may be historical but has very little heritage and numerous structural issues. Saving a building just to save it does nothing for a downtown that needs more people in it. "It may be historical but has very little heritage..." seems to be a bit of a contradiction. Most heritage advocates are not trying to save "everything." Saving heritage demands more than simply saving a facade. This simple fact seems to elude many in London and elsewhere, for that matter. Reading a paper on urban heritage in France, I came across this in reference to Haussmann and his approach: Street blocks had to be designed as homogeneous architectural wholes, while buildings, treated as independent structures, would together create the urban landscape. Saving a build, an entire building, is not enough. Why anyone thinks saving a facade comes with any bragging rights is beyond me. Save the facades of an entire block, or better yet two or three blocks, and if done right one might, just might, have something -- probably not a lot, but something. But saving one facade and it's like patching a pair of jeans and saving the patch, tossing the jeans and claiming you still have the pants. It's nuts. 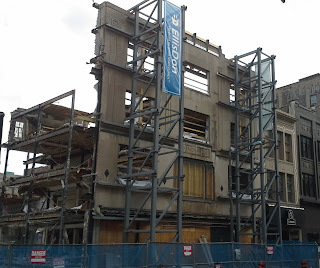 Saving the Kingsmill's facade will not keep the Dundas Street heritage character alive. That died a long time ago.